The Neil Brown MK3 conductivity-temperature-depth (CTD) profiler consists of an integral unit containing pressure, temperature and conductivity sensors with an optional dissolved oxygen sensor in a pressure-hardened casing. The most widely used variant in the 1980s and 1990s was the MK3B. An upgrade to this, the MK3C, was developed to meet the requirements of the WOCE project. The MK3C includes a low hysteresis, titanium strain gauge pressure transducer. The transducer temperature is measured separately, allowing correction for the effects of temperature on pressure measurements. The MK3C conductivity cell features a free flow, internal field design that eliminates ducted pumping and is not affected by external metallic objects such as guard cages and external sensors. Additional optional sensors include pH and a pressure-temperature fluorometer. The instrument is no longer in production, but is supported (repair and calibration) by General Oceanics. These specification apply to the MK3C version. Further details can be found in the specification sheet. The Chelsea Instruments Aquatracka is a logarithmic response fluorometer. It uses a pulsed (5.5 Hz) xenon light source discharging between 320 and 800 nm through a blue filter with a peak transmission of 420 nm and a bandwidth at half maximum of 100 nm. A red filter with sharp cut off, 10% transmission at 664 nm and 678 nm, is used to pass chlorophyll-a fluorescence to the sample photodiode. The instrument may be deployed either in a through-flow tank, on a CTD frame or moored with a data logging package. CTD profile data are presented from the Vivaldi '96 cruise Discovery 223, as reported by Leach & Pollard et al. (1998). The CTD profiles were taken with a Neil Brown Systems MkIIIb CTD (SOC modified) Deep01 mounted beneath a bottle rosette. The CTD was fitted with a pressure sensor, conductivity cell, platinum resistance thermometer, a Beckman dissolved oxygen sensor, a Chelsea Instruments Aquatracka MkIII fluorometer, a Sea Tech 100cm Transmissometer, a new 25cm pathlength Chelsea Instruments Alphatracka MkII Transmissometer, an SOC/Valeport Ultraviolet Nitrate Sensor, a Simrad altimeter (model 807-200m) and an IOSDL 10 Khz pinger. Lowering rates for the CTD package were generally in the range 0.5-1.0ms-1 but could be up to 1.5ms-1. CTD data were logged at 16 frames per second. The CTD deck unit passes raw data to a dedicated Level A microcomputer where 1 second averages are assembled. During this process the Level A calculates the rate of change of temperature and a median sorting routine detects and removes pressure spikes. These data are sent to the Level B for archival. The data are then passed to a Level C workstation for conversion to Pstar format and calibration. A total of 88 stations were occupied (12931 - 13018). Stations 12939, 12959, and 12973 were aborted due to bad weather. The 1 second data passed to the Level C were converted to Pstar format and initially calibrated with coefficients from laboratory calibrations followed by a number of calibration corrections. The up and down cast data were extracted for merging with the bottle firing codes, thus the CTD variables were reconciled with the bottle samples. Final calibrations were applied using the sample bottle data. Finally, down cast data were extracted but not sorted on pressure or averaged to 2db values. The data were worked up to WOCE standards by the data originators before being supplied to BODC. No further calibrations were applied to the data received by BODC. BODC were mainly concerned with the screening and banking of the data. The CTD data were received as 1Hz, but not pressure sorted, down cast data. Parameters were pressure (dbar), temperature (°C), salinity (psu), oxygen (µmol/l), chlorophyll-a (mg/m3) and Sea Tech transmittance (/m). Nitrate sensor data (att240, att220 and att300) were also received in the data files but were ignored. Stations 12931, 12932 and 13016 do not have calibrated oxygen. The chlorophyll data are fully calibrated except for stations 12931 and 12932. The data were converted into the BODC internal format (PXF) to allow the use of in-house software tools, notably the graphics editor. Attenuance was calculated as 1*log(transmittance), assuming a pathlength of 1 metre. Spikes in the data were manually flagged 'suspect' by modification of the associated quality control flag. In this way none of the original data values were edited or deleted during quality control. Attenuance is null from station 12974 to 13018 due to the Sea Tech instrument being removed after enough data had been acquired for comparative purposes with the new Chelsea transmissometer. The temperature, salinity and oxygen data from cruise DI223 required little flagging and just a few points were set suspect. The fluorometer and oxygen data are null for station 12990. Lots of bad Sea Tech attenuance data were flagged suspect. Once screened, the CTD data were loaded into a database under the Oracle relational database management system. The start time stored in the database is the CTD deployment time, and the end time is the time the CTD was removed from the water. Actually these times are more precisely the start and end of data logging. Latitude and longitude are the mean positions between the start and end times calculated from the master navigation in the binary merged file. Leach, H. & Pollard, R.T. et al. (1998). RRS Discovery Cruise 223. Southampton Oceanography Centre, Cruise Report No. 17, 68pp. The World Ocean Circulation Experiment (WOCE) was a major international experiment which made measurements and undertook modelling studies of the deep oceans in order to provide a much improved understanding of the role of ocean circulation in changing and ameliorating the Earth's climate. Goal 1. To develop models to predict climate and to collect the data necessary to test them. Goal 2. To determine the representativeness of the Goal 1 observations and to deduce cost effective means of determining long-term changes in ocean circulation. Southern Ocean - links all the worlds oceans, controlling global climate. North Atlantic - directly affects the climate of Europe. Two surveys, in the South Atlantic as part of the WOCE Hydrographic Programme. SWINDEX, a year long study of the Antarctic Circumpolar Current (ACC) where it crosses major topography south of Africa. ADOX, a study of deep water flow from the Atlantic to the Indian Ocean. ACCLAIM, a study of the ACC by altimetry and island measurements. NATRE, a purposeful tracer experiment to look at cross isopycnic processes. CONVEX, a study of the deep ocean circulation and its changes. VIVALDI, a seven year programme of seasonally repeated surveys to study the upper ocean. Long-term observations of ocean climate in the North West Approaches. Satellite ocean surface topography, temperature and wind data were merged with in situ observations and models to create a complete description of ocean circulation, eddy motion and the way the ocean is driven by the atmosphere. 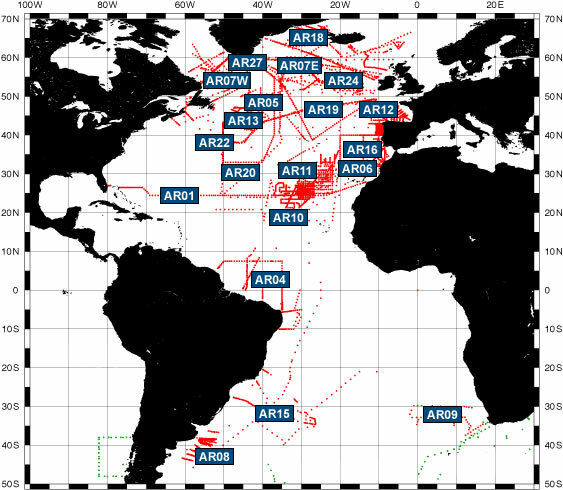 The surveys were forerunners to the international Global Ocean Observing System (GOOS). GOOS was later established to monitor annual to decadal changes in ocean circulation and heat storage which are vital in the prediction of climate change. WOCE was a major international experiment which made measurements and undertook modelling studies of the deep oceans in order to provide a much improved understanding of the role of ocean circulation in changing and ameliorating the Earth's climate. WOCE established numerous areas and repeat sections in the Atlantic Ocean as illustrated in the map below.